Have you ever sat in D.C. traffic on a hot day and seen a cyclist zooming past cars and thought, “That could be me?” Find out how you can. WASHINGTON — Have you ever sat in D.C. traffic on a hot day and seen a cyclist zooming past cars and thought, “That could be me?” Then find out how you can get ready to join the nearly 10,000 people who bike to work in the area. As the weather gets warmer and the days longer, it’s time to wipe the dust off that bicycle that’s been sitting in the garage over winter and make sure that it is in good, working order before your ride. Christian Myers of Velocity Bicycle Cooperative in Alexandria said that before going out on your inaugural ride, there are some checks and repairs that you can do yourself, starting with the basic ABCs. One of them is putting air in your tires. “You don’t want a pinch flat,” Myers said, which occurs when there is not enough pressure on the tires and the tube gets pinched on the rim. He said that it’s good to have a floor pump at home — one that has a gauge that will show what the pressure is — but you should also carry a pump that can fit in your bag or attach to your bike. How do you know how much air to put in? Look for the PSI number on the side of the tire. Before you go, make sure you can stop by checking the brake pads. A brake pad usually has grooves that are good indicators of its wear. Check both the front and rear brakes. If this repair is beyond your expertise, go to your local bike shop to have it replaced or a bicycle cooperative where you can learn how to do it. Chain, crank, derailleur, pivot points, etc. Another thing to do before hopping on the bike is to make sure that the chain is lubricated. There are different lubricants that are specifically for bicycle chains. Consult your local bike shop to see which is best for your riding conditions. To lubricate the chain, Myers said to come in with the lube in the center of the chain and spin the pedals a few revolutions. Then, wipe off extra lubricant with a rag. A properly lubricated chain will give you a smooth ride, prevent rust and protect the chain. He said it is also a good idea to lubricate the moving parts and pivot points of the bike, such as the ones on the derailleur and the pedals. Next, inspect your helmet to make sure there are no cracks in the plastic or the foam. Replace your helmet if you’ve crashed, dropped it hard enough that it cracked, or if it’s more than 3 to 5 years old depending on the manufacturer. Some other things Myers suggests to have with you on your ride are: lights for night-riding, a tire lever and an extra tube or a tube repair kit. Don’t forget a lock for your bike. In addition to a cable lock, invest in a ULock, said Leign Ann Evanson, an instructor at the Washington Area Bicyclist Association. Lastly, follow the rules of the road. Each jurisdiction may vary in its laws regarding helmets or where to ride, so check before you go. What’s holding you back from biking? The reasons vary: People don’t want to be sweaty when they get to work; there’s no place to park their bikes; it’s uncomfortable; there’s not a great route to get to the office. Whatever the reason is, Smith said there is usually a solution. Evanson, one of the instructors during a city cycling class on Sunday, April 30 in Arlington, said that for women the issues include the perception that cycling could be unsafe. 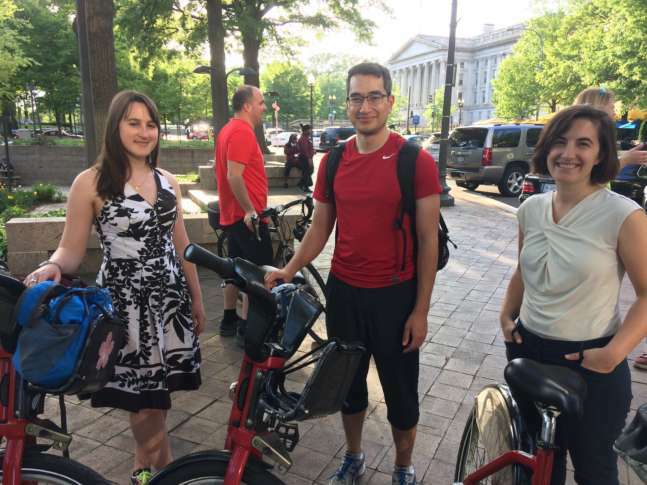 Ana Karimi joined a WABA community ride on Wednesday, April 26 in Pershing Park in D.C. that took riders through some bridges in the area. Karimi works in Tysons Corner, Virginia, and she wanted to figure out if she can do Bike-to-Work Day on May 19. The last few miles to get to her work would be on a busy road. There may also be a vanity issue, Evanson said. “They want to go to work without having to change or put their make up on,” she said. Evanson is a member of WABA’s Women’s and Bicycles program. She said that there’s a “kind of bro culture that can sometimes be intimidating,” and the program is a safe space for women to do whatever they want to do on bikes. “It’s meeting them where they are, whether they want to go for a ride to church or to work or they want to start mountain biking … or going for long rides. Whatever it is, they’re going to find a subset in that community,” Evanson said. To help people get ready to start bicycling, WABA has classes and seminars for people at different levels. If you haven’t ridden for awhile and need a refresher on how to shift, or you are new to the city, or you’ve never learned to ride a bike, WABA offers a class to meet different needs. Riding on the road versus the sidewalk? Evanson said that cyclists should be conspicuous, predictable and should communicate to others what they are doing. “Riding a bike was fun when you were a child. There’s a whole reason that it was fun, and it’s just as fun,” Smith said.